If you're looking for value, stick with the base four-cylinder Terrain. Highly optioned V-6 versions can exceed $35,000--almost within buying reach of the Cadillac SRX. 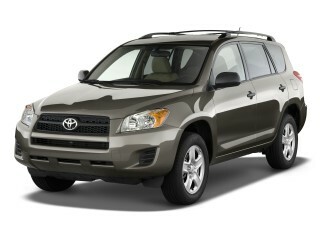 Excellent fuel economy and a comfortable cabin are a big contrast to the 2012 GMC Terrain's boxy shape. New in 2011, the GMC Terrain comes back for the 2012 model year with minor changes, mostly to its infotainment systems. The Terrain is the junior member of the GMC family, the smaller of its two crossovers (the Acadia is the other). A close relative of the Chevrolet Equinox, the Terrain shares most of the Chevy's good points, including tidy proportions, a relatively roomy interior, and a list of thoughtful features for people and cargo. 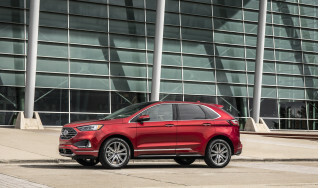 Front-wheel drive is standard, with all-wheel drive an option, and the Terrain gets up to 32 mpg on the EPA highway cycle, making it a great choice in a field that includes the Ford Edge, the Honda CR-V and the Toyota Venza. The Terrain's a standout in styling, but it could dial down its extremely aggressive look. Chunky, large fenders flare out in an overly exaggerated way around the wheel wells, and they give the Terrain a look that's part Tonka, part novelty. The upright stance and the tall, broad grille are more traditionally GMC, and probably enough of a distinction by themselves, from the softer-looking Equinox. The Terrain's cabin is much more conventionally styled--it's more soft and carlike, with just the right amount of blocky detail and metallic trim, more in tune with the tasteful cabin of the larger Acadia. 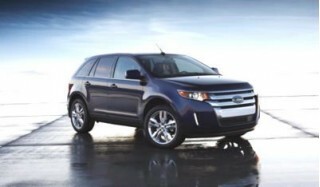 Both powertrains available in the Terrain are shared with the Equinox, right down to their great gas-mileage ratings. 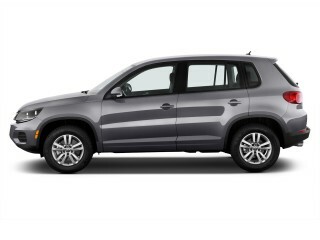 On base vehicles, there's a 2.4-liter four-cylinder engine with direct injection, making 182 hp. Upscale versions have a 264-hp, 3.0-liter direct-injected V-6. Both are teamed to six-speed automatic, which in our experience could use some more refinement in its shift points and in the gear swaps themselves. Dig deep into the four-cylinder, and you'll probably find it has plenty of power for almost every need; we think the V-6 is only necessary if you're always filling all the Terrain's seats, or maxing out the six-cylinder's 3500-pound towing capacity. Without a third-row seat, the Terrain might strike some family shoppers as less useful, but we've found the Terrain quite comfortable, even for four adults. GM has carved out good space inside a tidy package, and fitted the Terrain with very comfortable front bucket seats and a rear bench with enough support.The rear seat slides over an eight-inch span so passengers or cargo can get higher priority, and the seats fold to boost storage up to 31.6 cubic feet. However, the Terrain's cargo floor is high for its class, and the seats don't fold completely flat. All versions have a big, deep glove box, a storage bin over the center stack of controls, and an armrest storage bin deep enough to hold a small laptop. Wind and powertrain noise are admirably low in the six-cylinder models, but four-cylinders have noticeable drivetrain whirs and ticks--one of the classic soundtracks to today's direct-injection engines is a ticking as fuel is delivered, and it's pretty evident here, though the four-cylinder gets a noise-cancellation system that's meant to cut down on perceived cabin noise. Excellent safety scores are part of the Terrain profile. The NHTSA gives it four stars overall, while the IIHS calls it a Top Safety Pick. Along with curtain airbags and stability control, a rearview camera is standard--and necessary, since the Terrain's styling creates big blind spots. All Terrains come with standard climate control; AM/FM/XM/CD sound with a USB port for media players; keyless entry; a power driver seat; and ambient lighting. Newly standard is a touchscreen-driven audio system that will also be able to connect music apps on smartphones to the car's audio system, enabling Bluetooth voice control and streaming music from sources like Pandora. Options include remote start; Bluetooth; a rear-seat DVD entertainment system; and a navigation system with hard-drive map and music storage. Brutalism finds a new champion in the exceedingly boxy 2012 GMC Terrain. Back in the Soviet era, they called it Brutalism: architecture dedicated to regular, angular forms that put emotion--even windows--well down on the priority scale. The GMC Terrain is about as brutalist as any new car gets. More boxy than a HUMMER, just shy of a Transformer, the Terrain just has no time for the niceties of a curved line or a softened profile. The stance isn't just upright--it's bolt upright. The fenders block off competing views like a linebacker's shoulders. Polarizing? Yep, as much as the old H2 was, and the Terrain doesn't seem to have suffered from inheriting that quasi-military design language. While the Terrain's exterior is a little more distinctive and macho than the Chevrolet Equinox, along with most other compact crossovers, its instrument panel is much like that of the Chevy: a somewhat V-shaped center stack, housing audio and climate controls, and flanked by large vertically oriented vents, is the center point of the design, and otherwise details and trim look chunky, with the same cloudy metallic surfaces that are now used inside other GMC vehicles. A shroud over the display area are the top doubles as a shallow storage bin just as in the Equinox, but reddish mood lighting bathes footwells and other interior areas in the Terrain. 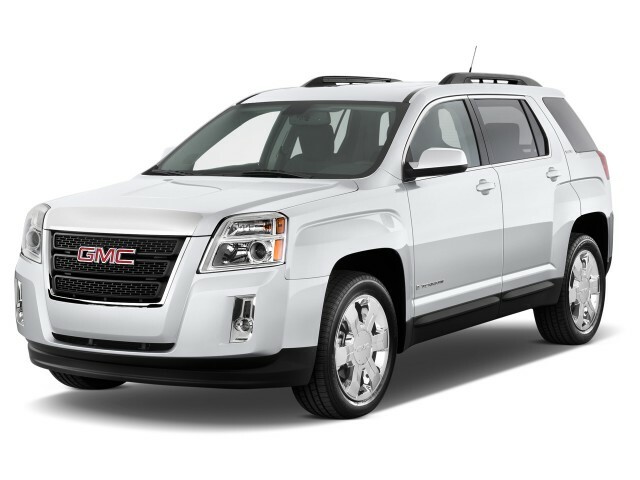 The 2012 GMC Terrain gives drivers a pretty clear choice: four-cylinder fuel economy or six-cylinder punch. The Terrain was new for the 2010 model year, and with it came a pair of new engines that give shoppers a clear choice between sometimes competing priorities. 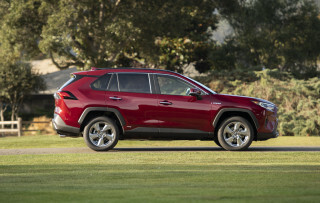 The base engine in the Terrain is a 2.4-liter four-cylinder. With direct injection for better fuel economy, the engine develops 182 horsepower, channeled through a six-speed automatic transmission and either front- or all-wheel drive. Though it's not exceedingly quick on its feet, and needs active noise cancellation to dull its effect on the cabin, this is the powertrain we'd choose. It's fine for the style of daily-commuter driving the Terrain will encounter most often, even okay once it's laden with the extra weight of all-wheel drive and extra passengers. Mostly, it's thin low-end torque that keeps it from being an even more convincing choice. An "ECO" button on the dash in the four-cylinder model lowers the torque converter lockup speed to 1,125 rpm for enhanced efficiency, though then the engine feels a little less responsive. For those who tow, there's the upgraded V-6 engine. With 264 hp, the 3.0-liter six helps itself to more gasoline, but puts it to good use. It's more refined in feel, and it can handle up to 3,500 pounds of towing weight, versus 1,500 pounds with the four-cylinder. The Terrain's six-speed automatic isn't quite as adept at managing shifts as we'd like. Especially with the four-cylinder engine, it tends to lag when shifting, taking its time to lock up fully, in the name of fuel economy. A few cockpit foibles aside, the Terrain delivers comfortable seating for five, and a high level of interior quality. Without a third-row seat to tote even more people, the 2012 GMC Terrain can't quite meet the needs of every buyer out there. But the Terrain's interior is very good for adults, something to consider if you're shopping a smaller crossover, even one with a third-row seat. 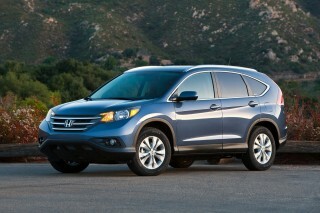 In front, the Terrain feels wide open, and the impression's amplified by comfortable seats with some mild bolstering. They leave plenty of room for taller drivers, even when the seat cushion is raised, and it's pretty simple to find a good driving position with the standard power driver seat and tilt/telescoping steering. The second-row bench seat is really where the Terrain shines. Like the Equinox crossover, the Terrain's back seats slide back and forth over an eight-inch span to expand leg room or cargo space behind the seat itself. When the seat is pushed forward, the Terrain has as much as 31.6 cubic feet of stowage; by folding the bench forward, the Terrain has nearly 64 cubic feet of cargo space. It's not quite as easy to use as in some crossovers, since the Terrain's load floor is a little high, and since the back seats don't fold completely flat. Whether you choose durable fabric or the quality-feeling leather, interior build quality and comfort is not an area for complaint in the Terrain, but some trim pieces disappoint with a hollow, hard plastic feel; the release for the bin at the top of the instrument panel, a thin piece of chromed plastic, feels especially brittle. Unique to the four-cylinder is a special active noise cancellation system that works through both the built-in audio system and a few dedicated speakers to allow the engine to run at its most efficient RPM range. It also prevents what engineers call a "booming" resonance in the cabin that would otherwise occur. The 2012 GMC Terrain just gets safer with new standard features, though visibility is still an issue. With some very good crash-test scores already in the bank, the 2012 GMC Terrain is bent on improving its safety even more. The Terrain already earns some of the best ratings from the National Highway Traffic Safety Administration (NHTSA), which gives it four stars overall, with sub-ratings of four stars for frontal impact protection, and five stars for side impact protection and for the new side-pole test. 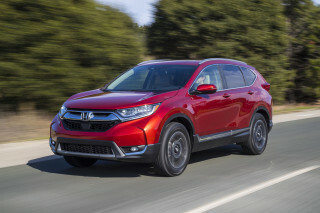 The industry-funded Insurance Institute for Highway Safety (IIHS) gives the Terrain scores of "good" in all its tests, which makes the crossover a Top Safety Pick. Standard safety features include anti-lock disc brakes, stability control, and a full complement of airbags with dual-stage frontal and thorax side-impact, driver and front passenger, and protection for head curtain side-impact at both front and rear outboard seating positions. This year, the Terrain also gets a standard rearview camera, which displays on its larger new LCD screen--where last year's optional camera displayed on the rearview mirror, if the Terrain lacked a navigation system. The camera's a well-conceived addition, since visibility in the blocky, chunky Terrain can be difficult. Rearward visibility can be downright horrible for some drivers, and rear-seat headrests don't remove or fold down to open up vision in the rear-view mirror. GMC also offers rear parking sensors as an option, which we'd also recommend. A new lane-departure warning system and forward-collision alert have been added to the options list as well. 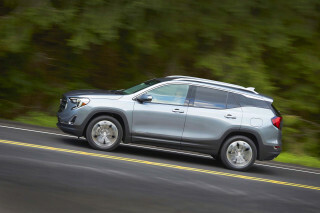 The 2012 GMC Terrain is starting to get the infotainment knack; new connectivity this year brings streaming audio into the mix. The GMC Terrain justifies its price premium over the similar Chevy Equinox with more standard equipment, and it's bringing that list up to date with better connectivity this year. All Terrains now get standard air conditioning; power windows, locks and mirrors; fog lamps; an AM/FM/CD/XM audio system with three months of service and a USB port for media players; a power driver seat; ambient lighting; and a rearview camera. On the options list, there's a touchscreen-driven navigation system that bundles in 10GB of music storage next to 30GB of map storage; Bluetooth; remote start; steering-wheel audio controls; leather upholstery; and a DVD entertainment system. All told, a loaded Terrain passes the $35,000 pricetag, which nearly overlaps the sticker on a larger, seven-seat GMC Acadia. Later this year, the Terrain adds GMC Intellilink, which integrate smartphone features via Bluetooth and USB. So enabled, the Terrain's audio system will be able to stream audio from smartphones through apps like Pandora. Gas mileage is a major selling point for the 2012 GMC Terrain. A new entry in the GMC lineup in 2010, the Terrain is the truck brand's most fuel-efficient vehicle, and it's also one of GM's best crossovers for gas mileage. The base Terrain's 2.4-liter four-cylinder gets some of the latest gas-saving features, like direct injection, in its quest for efficiency. 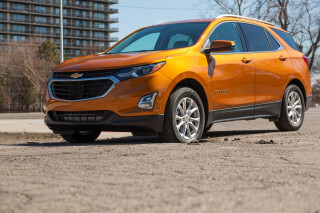 It pays off, too: it's rated by the EPA at 22/32 mpg, higher than all its mid-size crossover competition save for the nearly identical Chevy Equinox. 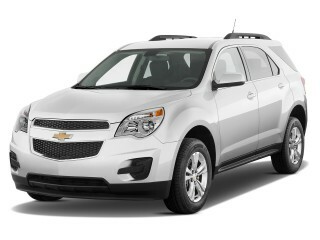 Even the addition of all-wheel drive doesn't harm mileage too badly: the AWD Terrain still earns a 20/29-mpg rating. Perhaps even more of interest in four-cylinder models is the new 'Eco' button which, when engaged, causes accessories like the air conditioning compressor to be a little more conservative, has the torque converter lock up a little earlier, and makes the transmission a little more reluctant to downshift. Once you choose the Terrain's optional V-6, the numbers take a big fall. The 3.0-liter V-6 makes much more power, but that leads to gas mileage of 17/24 mpg--or even 16/23 mpg when all-wheel drive is fitted.